Tottenham’s Clarrie Cunningham at 95, is the oldest returned serviceman in the district. He spoke at Tottenham’s Anzac Day Service, on his trip to Borneo, where he served in World War II. Mr Cunningham was born at Nurse Floyds Maternity hospital in Condobolin and lived most of his life in the Condobolin and Tottenham areas. 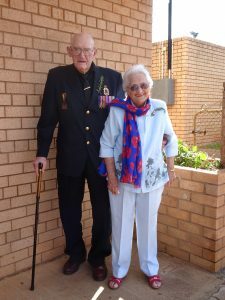 Clarrie married Marj Smith in Condobolin in 1947. They celebrated their 71st wedding anniversary on 26 April and now live in retirement in the Tullamore Multi Purpose Centre. Image Credit: Jenny Day.